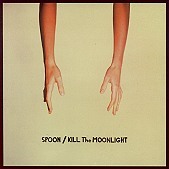 On Spoon's fourth full-length and second for Merge, KILL the MOONLIGHT, the band takes chances beyond the standard indie rock offerings of their past, elaborating on the pop sensibilities of 2001's Girls Can Tell, further exploring what they hinted at there. "Small Stakes" is all keyboards and tambourines, as front man Britt Daniels' voice gives the song its bite, building the number with a rock 'n' roll snarl before the full band launches in and brings a wall of drums. "The Way We Get By" is what you'd get if a young Mick Jagger tried to fit in to an indie pop band that loved the sound of a jumpy keyboard in their songs. Daniels takes it a few steps further, playing to the piano's rhythm and highlighting the hooks as the band turns the song into a jangle-y ditty that is not short on rock. "Jonathon Fisk" is a guitar-driven indie rocker, crunchy and melodic, pulling back the punches somewhat to allow the pop some breathing room. "Paper Tiger" is a quirky keyboard number light on the percussion, with two drumsticks keeping the beat in the background. And "Someone Something" is pure piano pop. The songs on KILL the MOONLIGHT are bouncy and melodic, ripe with hooks, rolling with Daniel's voice, which knows when to push the pop agenda and when to turn an otherwise soft pop song into a half-way rocker. Here is an album that showcases songwriting and arrangement abilities, a mature indie rock album that hasn't forgotten how to rock, but has learned when it is time to try new things. I'll give it an A.